On March 8, 2012, a friend forwarded an obituary to me from the Houston Chronicle. It was a short appreciation and remembrance of a musician by the name of Walter Price who had passed away the day before. The Chronicle obit pointed out that Price’s stature was such that he demanded not one, but two nick names. 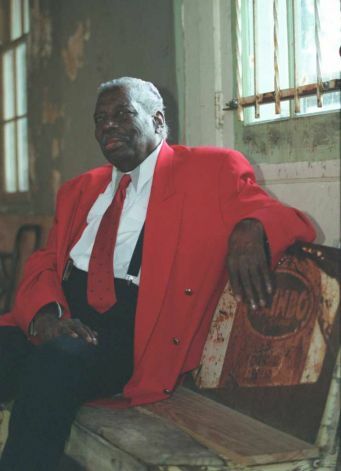 His stature was also such that few in or outside the city of Houston ever even heard of the man known as “Big” Walter Price “The Thunderbird.” Price was 97; this just might have made Price the oldest living blues musician at the time of his death. He was an accomplished piano player, songwriter and singer, rooted in the Texas “barrelhouse piano” tradition. Even in Houston, where he was revered within the blues community as one of the last living links to the halcyon days of that city’s famed Peacock label, Price was somewhat of an elusive anomaly. He didn’t seek the spotlight but was not afraid of it either. Twenty years or so ago, I saw Price play a relatively short, yet rousing, opening set at a large showcase nightclub called Rockefeller’s. With the aid of a cane, he made his way off stage and was heading to the back of a crowded nightclub. Price had already whipped the crowd into a frenzy and the emcee was trying to get an encore out of Price. As Price was walking towards me he said, “The ball is already rolling downhill, why kick it.” He felt no need to play an encore. He had already made his musical statement. That comeback was the providence of one man, the late guitarist and bandleader Jerry Lightfoot. Lightfoot was the front man for the ensemble, Jerry Lightfoot and the Essential Blues Band, later shortened to simply The Essentials. Lightfoot would often bring Price up to the stage during one of his band’s performances with a very respectful introduction befitting the very talented and yet often overlooked musician. Price would take a seat behind the piano and sing three or four numbers and then yield the bandstand to the much younger performers. The man, who was at the time in his seventies, became a fairly regular fixture at the small east end nightclub, Local Charm. 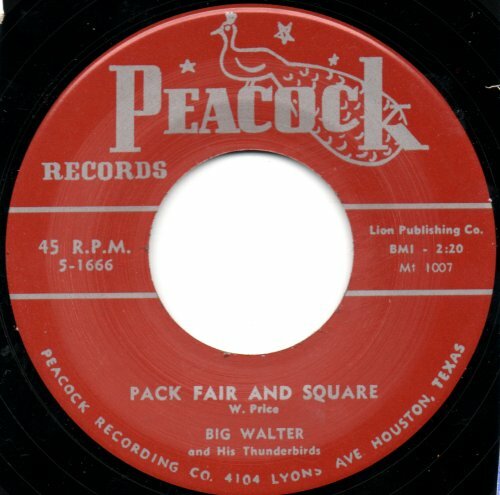 Big Walter would share with me stories of recording for the notorious Don Robey at the legendary Peacock studios. With a near photographic memory he would also tell me of his 50 plus recordings and playing in front of packed houses at the old Peacock Ballroom in Houston. 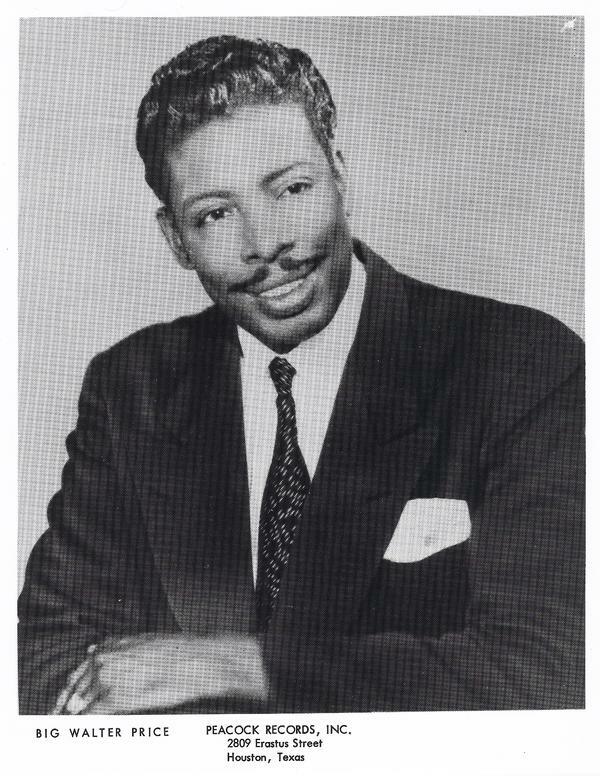 The city of Houston declared June 6, 1989, ‘Big Walter Price Day’. That evening Price was presented a proclamation at the annual Juneteeth Blues Festival held at the Miller Outdoor Theatre. He was also named the festival’s Artist of the Year. In an era long before the internet and social networking, on several occasions I saw Big Walter reach into the inside pocket of his sport coat and show people the press clippings from that event. He was justifiably proud of his cultural contribution to his adopted hometown and to the blues landscape at large. He seemed fairly certain that his legacy had all been forgotten. I, for one, will never forget “Big” Walter Price “The Thunderbird”.